Baseball may be one of the most popular sport in the world, but here in Singapore, its popularity has yet to reach the heights of other sports such as football and basketball. 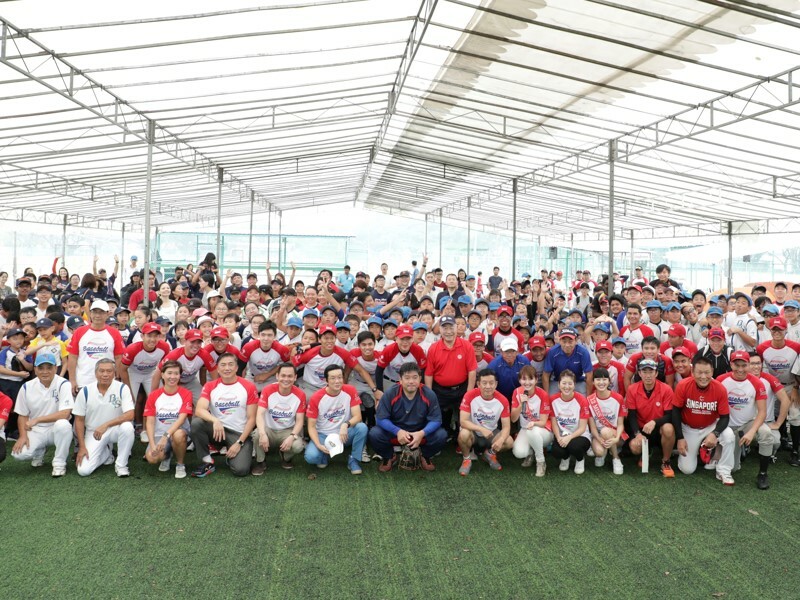 However, all that may change as Cambodian non-governmental organisation - Three Hearts Foundation, held its first "Baseball Catches Hearts" event in Singapore on Sunday at the Kallang Diamonds. The brainchild of former Miss Japan, Miss Hisae Arai, and her Three Hearts Foundation, Baseball Catches Hearts wants to tap on the popularity of the game amongst the Japanese community in Singapore to spread the love of the game among Singaporean youth. “We (Three Hearts Foundation)… are focused on doing charitable works in Cambodia and sometimes in Thailand. Our aim is to improve awareness in three areas: health education, cultural exchange and sports development,” said Miss Arai. The Baseball Catches Hearts event was graced by H.E. Kenji Shinoda, Japan’s Ambassador to Singapore, H.E. Sokveng Ngoun, Kingdom of Cambodia’s Ambassador to Singapore and and Mr. Lim Teck Yin, CEO of Sport Singapore. “We were informed about the Three Hearts Foundation by our counterpart from Tennis Cambodia, Mr Rithivit Tep,” remarked Sport Singapore CEO Lim Teck Yin during an interview. “He told us how Miss Arai wanted to extend, beyond Cambodia, the work of the Three Hearts Foundation and she thought about bringing the Japanese and Singapore communities together through baseball,” he continued. During his opening remarks, Mr Lim touched on the strong relationship between the two countries and his pride at how, in the field of sport, the relationship continues to grow. Other VIPs included Mr. Hideo NOMO, Representative Director of NOMO Baseball Club and Advisor to San Diego Padres, Mr. Hiromasa Arai, Baseball Commentator for NHK, Member of Golden Players Club and former director of Japanese Professional Baseball (NPB) teams and two former Miss Japans in Kiko Arai and Hisae Arai. The two Japanese baseball legends gave clinics on the finer points of pitching and hitting. 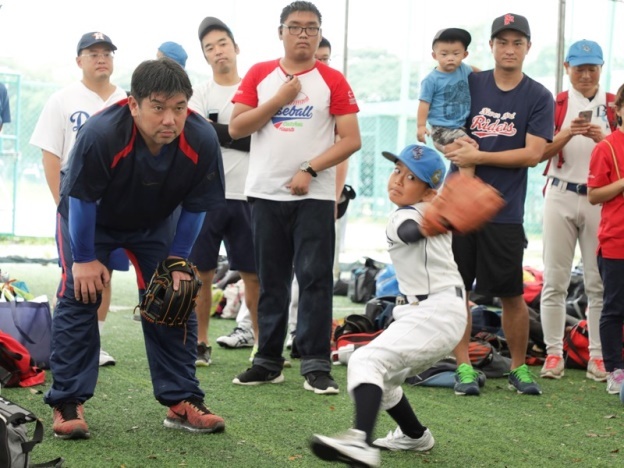 Mr Hideo Nomo showed off his fabled tornado delivery to the delight of the 500 strong crowd consisting of parents, teachers, students and members of the Singapore national baseball team. The lucky ones who got to demonstrate their pitches were given pointers to improve their technique. Former Major League Baseball player and Japanese baseball hall of famer, Mr Nomo related how his love for baseball has built character and this love pushes him to spread baseball around the world. “I hope the young kids that were here today will continue to love baseball, continue to work hard, train hard and I hope we are able to hold similar events in other developing countries,” said the former Los Angeles Dodgers pitcher through an interpreter. Another Japanese baseball legend Mr Hiromasa Arai took charge of the hitting portion of the clinic. He patiently went through the process of batting with the young participants. His wisdom and knowledge, gleaned from decades of experience playing in Nippon Professional Baseball, paid immediate dividends as the youngster flashed smiles as they went from swinging and missing to hitting imaginary home runs. Miss Lee Weiqin, a teacher at Sembawang Primary School in charge of the softball program, brought her young team to the event. “I thought it would be a good experience for my girls to learn from the experts how to play the game and to interact with other people and gain from their experience as well,” she said. “My girls were a bit to shy to go up and practice the pitching because after all baseball and softball pitching are very different. But I think through what they’ve seen they have absorbed (knowledge),” she continued. The day’s event culminated in a baseball game called “Compete for Friendship” where the Japanese selection narrowly beat the Singapore national baseball team.